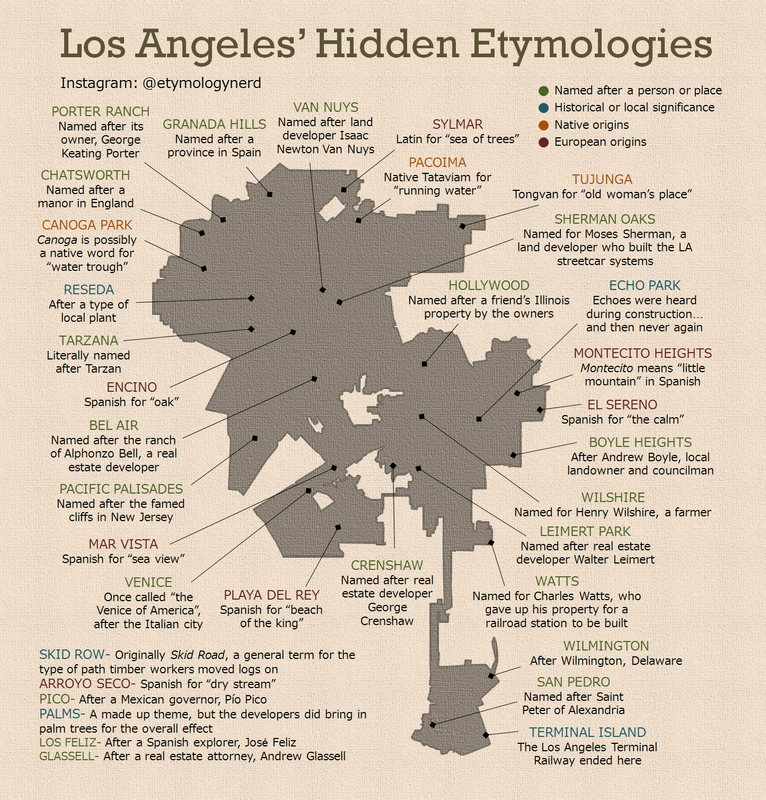 An infographic titled Los Angeles’ Hidden Etymologies dives into the origins of various Los Angeles neighborhood names. The infographic was created by Adam Aleksic, a high school junior in upstate New York, who is a self-admitted etymology nerd—in fact, that’s name of his blog, Instagram, and YouTube channel, where he frequently posts about word origins. In November of that same year, Aleksic started his Etymology Nerd blog. He’s since completed over 500 blog posts, 13 videos, and 37 infographics. 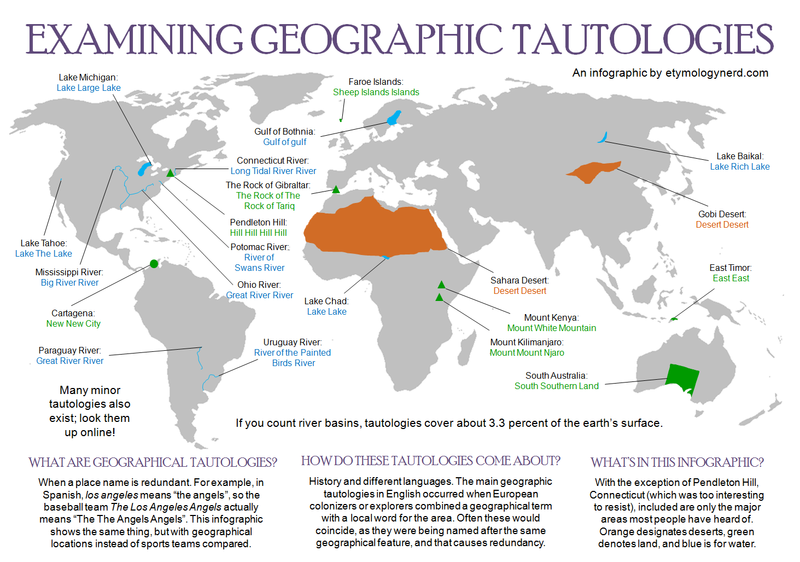 One of his favorite pieces is on geographic tautologies. A tautology is when the same thing is said twice, like when people say “ATM machine,” even though ATM stands for automated teller machine. In Aleksic’s infographic, he notes where a place has been named in a similarly repetitive fashion. For instance, “Sahara” is an Arabic word for desert, so the Sahara Desert is redundant. Aleksic got the idea to do geographic locations after wondering about the origin of the Manhattan neighborhood, Hell’s Kitchen. 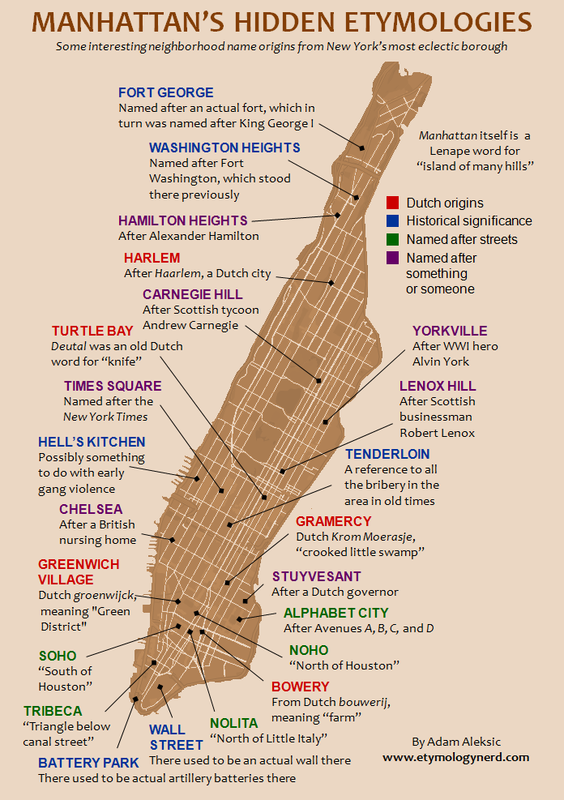 (Find the Manhattan infographic here.) Aleksic noted that as an East Coaster, he’d only heard of a few L.A. neighborhoods, like Hollywood and Watts, but now knows quite a few. Leaving out neighborhoods with obvious origins, like Chinatown, Aleksic examined 35 names, spanning from East L.A. to the coast, and from the Valley to the Port of Los Angeles. 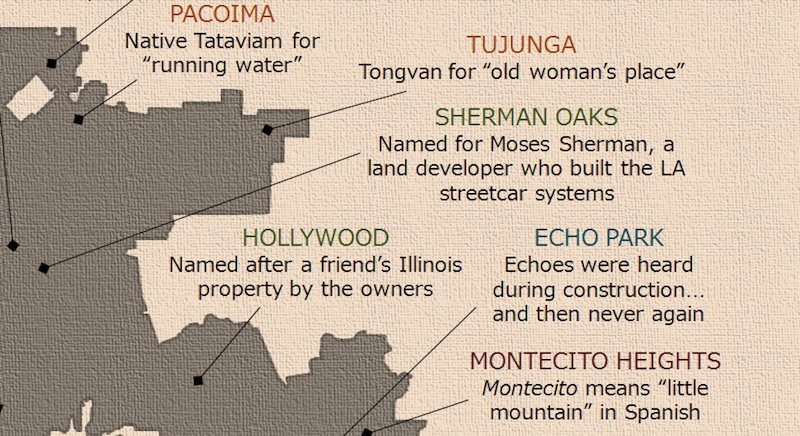 He found himself surprised by how many Los Angeles area neighborhoods are named after real estate developers. “Of the 35 neighborhoods I looked at, seven were named after people with connections in the real estate business,” he said. That includes places like Leimert Park, named for real estate developer Walter Leimert, and Crenshaw, named after developer George Crenshaw. Tarzana is named for the character Tarzan. According to writer Hadley Meares, Tarzan author Edgar Rice Burroughs bought the estate of Los Angeles Times publisher Harrison Gray Otis in 1919. It was called Mil Flores (Spanish for “thousand flowers”) as the time of sale, but Burroughs renamed it Tarzana. Burroughs later divided some of the property into subdivisions, which did not sell as well as he expected. He eventually sold the estate to a development company, and residents ultimately adopted Tarzana as their official name. Next up, Aleksic plans to look into neighborhoods in Chicago and New Orleans before moving to science-related etymology projects. Despite his passion, he’s not planning on going into a linguistic field, but law.